After summer days spent san socks, thanks to the ease of wear of flats, sandals, and heels, it can seem like a slight annoyance to now have to dig through your sock drawer to find a matching pair (the struggle is real). 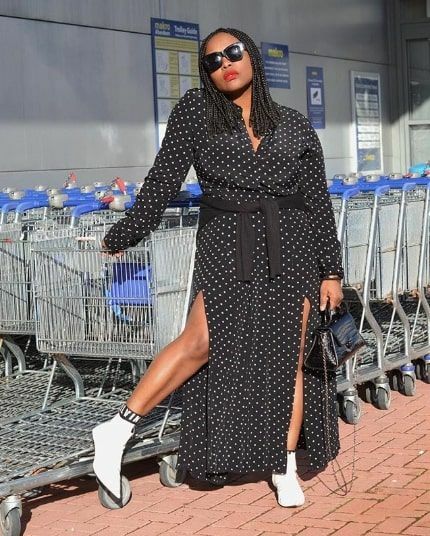 It's no longer possible to leave the house with bare feet, but as it turns out, fashion-forward socks can actually make for a great wardrobe addition—especially when worn with a pair of boots. As proof of this, we've searched through Instagram to find some examples of how fashion girls are wearing socks with boots this winter, from the always-classic no-show picks (perfect when wearing sock booties that leave very little room for anything else) to high-knee athletic ones you wore to during your high school volleyball match (yes, we're serious). One look at the below outfits and you might just be convinced to leave your socks peeking out over your boots the next time you step outside of your house. Read on to see the best socks with boots outfits, and then shop our favorite trend-forward socks. Try a pair of socks with logo ankle detailing. Match your socks to your suit and only allow them to peek through slightly. Slip into white mesh socks to contrast low-top Dr. Martens. Or a pair of black mesh ones to match your black booties. Mix and match styles by pairing tall athletic socks with lace-up combat boots. Thick knit socks are a must-have this winter (and work great with a pair of hiking boots). Coordinate your socks to your outfit's color palette—in this case, pink undertones. Logo socks instantly up the cool factor of plain black boots. No-show socks are great for short booties. Clear boots worn with neutral-colored high-knee socks is a great combo. Black socks and white boots—the perfect combination. Gray wool socks will keep your feet toasty all winter long. Wear your favorite cutout boots in the cold-weather months, as well, simply by adding in socks. We love the idea of pairing bright yellow socks with snakeskin print boots. For a pop of color, add in tall, red socks. Metallic socks perfect for New Year's Eve. The perfect pink socks to wear with all your winter boots. An easy way to add some texture into your look. Pair these with white booties. Next up, shop the best socks to wear with sneakers.